Teach Elementary-Level Math With Ease! 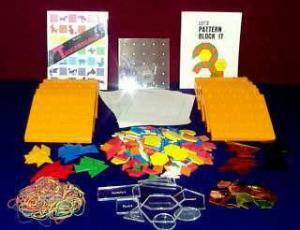 This kit includes double sided geoboards (12) with rubber bands, one overhead geoboard, shape tracer set, pattern blocks, over head pattern blocks, tangrams (16 puzzles), overhead tangrams, a Tangramables book, a Let’s Pattern Block It book and geoboard dot papers. An ideal kit for any math classroom.